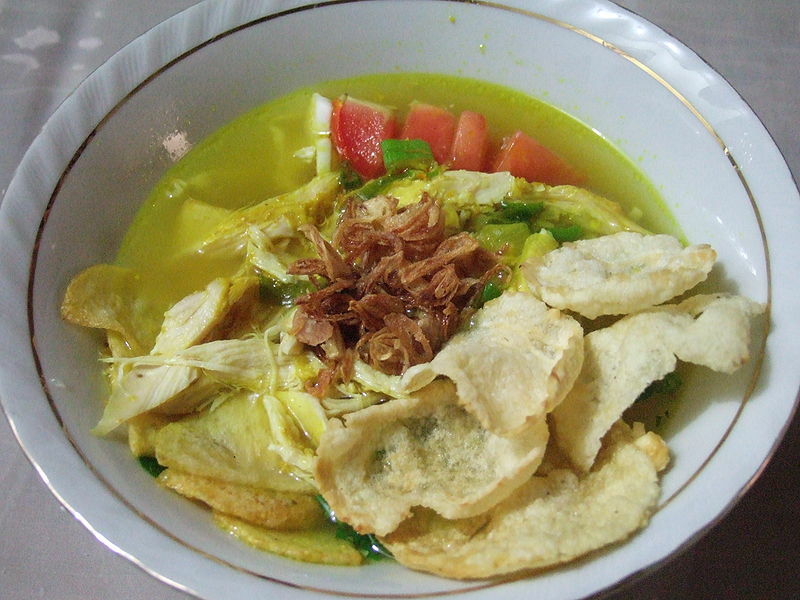 Soto, sroto, tauto or coto is a common dish to be found in various regional variations of Indonesian cuisine. It is a soup mainly composed of broth, meat and vegetables. Left: Soto Ayam (Indonesian chicken soup). It has a transparent yellow broth (coloured with turmeric) and is topped with fried shallot. The meats that are most commonly used are chicken and beef, but there are also variations with offal, mutton, water buffalo meat and pork. The soup is usually accompanied by rice or compressed rice cakes (ketupat or buras). Sotos are commonly differentiated by the meat ingredient in them, e.g. soto ayam (chicken soto) and soto daging (beef soto). Offal is a very common ingredient in soto, and is considered as a delicacy: the rumen (blanket/flat/smooth tripe), reticulum (honeycomb and pocket tripe), omasum (book/bible/leaf tripe) and the intestines are all eaten. Other ingredients of soto include soon alternatively spelled as sohun (rice vermicelli), mung bean sprouts and scallion. Soto spices include the following: shallot, garlic, turmeric root, galangal, ginger, coriander, salt and pepper. Soto can have a clear broth, a yellow transparent broth (coloured with turmeric) or a milky coconut-milk broth.